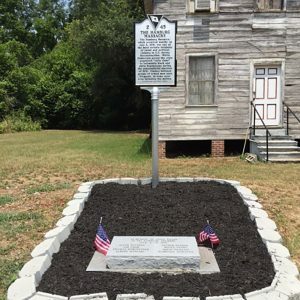 The Hamburg Massacre, which occurred nearby on July 8, 1876, was one of the most notable incidents of racial and political violence in S.C. during Reconstruction. White Democrats across the state organized “rifle clubs” to intimidate Republicans during the gubernatorial election of 1876. After a dispute between whites and a black militia company, about 200 men from local rifle clubs tried to disarm blacks barricaded in a warehouse. One white was killed and men on each side were wounded before the blacks fled. Two blacks were killed trying to escape. Whites captured 25-30 blacks and executed four of them.